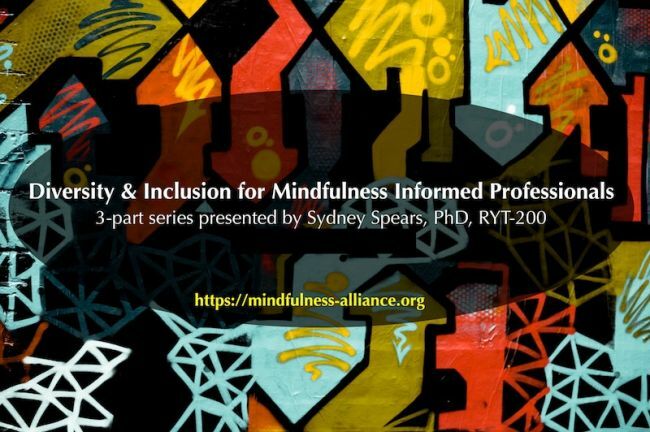 3-part series on diversity, equity and inclusion for mindfulness informed professionals taught by Sydney Spears, PhD, RYT-200 at Seeking Solace Yoga in Overland Park, KS. Dr. Spears will guide participants in an experiential exploration of cultural self-awareness to help us better serve the diverse individuals and groups we work with. This training is appropriate for anyone who uses the attitudes and practices of mindfulness in their work with others. Wear comfortable clothing, bring a yoga mat and if desired, a meditation cushion. Rental mats ($3 cash), chairs and props are also available through the studio.